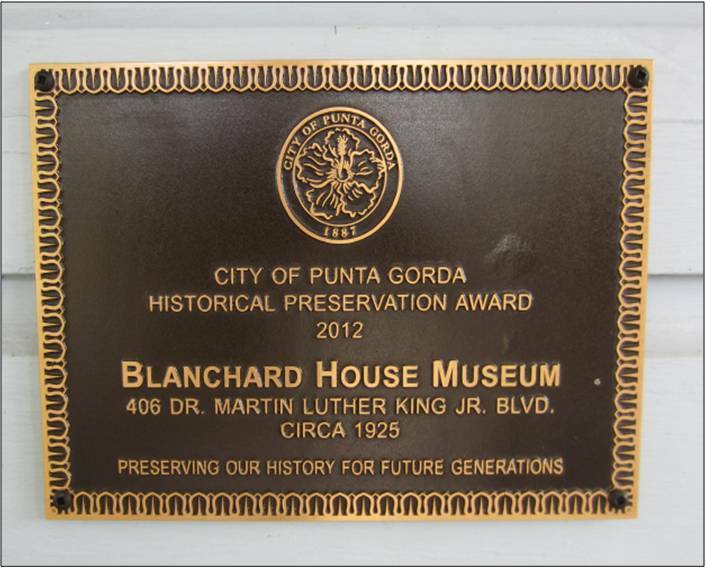 The Blanchard House Museum is an open access, educational institution devoted to the procurement, preservation, study, and display of artifacts and materials related to the history, culture, and contributions of African Americans in the settlement and development of Charlotte County and Southwest Florida. The Blanchard House Museum, established in 2004, was the vision of Bernice Andrews Russell. Mrs. Russell was a humanitarian, social activist, and historian for the African American community. She felt it was important to document the history and contributions of African Americans in Charlotte County. The Bernice A. Russell Community development Corporation, created in her honor, is dedicated to continuing the work begun by Mrs. Russell. Originally located 3 blocks from its present location, the house was built in 1925 and was moved in 2002. It was built for the owner, local fisherman Joseph Blanchard and his wife Minnie. He was born in St. Augustine, and had been a steam boat pilot, and she was a mail order bride from Louisiana. The house is a Florida vernacular style Craftsman bungalow was originally built with just 4 rooms and a front porch. The Craftsman style house was the dominant style for smaller houses built throughout the country during the period from about 1905 until the early 1920s. The Blanchard House is a single story, front gabled roof Craftsman – about one third of Craftsman houses built are of this subtype. The front porch is a partial width design and gives the house its southern charm. The house is elevated on pilings and features 9 foot ceilings. The Blanchard house is one of a few remaining examples of this type of residential architecture left in Charlotte County in the 1920’s. Many years after the passing of Minnie, the house was purchased by Bernice Russell in 1997; after all of the Blanchard heirs were deceased. Upon her death in 1999, the house was donated to the Bernice A. Russell Community Development Corporation by her daughter, Dr. Martha R. Bireda, and her children. Dr. Martha Bireda serves as the executive director of the museum. The Blanchard House Museum does accept some historical donations. The museum specializes in African American history of Charlotte County and Southwest Florida. The donations are handled on a case-by-case basis. If you have an item that you are considering donating – please use the Contact Us page to describe the item. A staff member will contact you. The museum does not accept African art, carvings and sculptures. For those types of donations please contact the Black Archives in Miami at http://www.theblackarchives.org/. Thank you. Bernice Russell was born in Marianna, Florida and was reared in Punta Gorda. She was a descendant of one of the first African American pioneer families to settle in Punta Gorda. She attended and graduated from the Baker Academy, Punta Gorda and graduated from high school in Ocala, Florida at Howard Academy. Mrs. Russell was a humanitarian, social activist, community leader and historian for the African American community. Bernice’s pride in her roots and cultural value of “giving back” motivated her to chronicle African American’s history, culture and contributions in Charlotte County. She passed away before her fondest dream of establishing an African American museum had been realized. Our Winter Newsletter is available for you to read or download. The museum conducts ongoing research on pioneer families, historic home sites, old newspaper articles, early business owners, and Florida Maroon studies.